FILE - In this Oct. 10, 2017, file photo, the U.S. Supreme Court in Washington is seen at sunset. 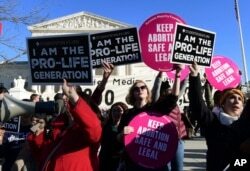 Abortion rights emerged as a major topic of discussion on Sunday among U.S. senators who will vote on President Donald Trump’s eventual Supreme Court nominee to replace Justice Anthony Kennedy, who is retiring at the end of the month. Abortion has been legal nationwide in America since a landmark 1973 Supreme Court decision, Roe versus Wade. Subsequent court decisions have reinforced the rights of women to terminate pregnancies. As a candidate in 2016, Trump signaled a clear intention to pave the way for overturning Roe versus Wade by nominating socially conservative jurists likely to believe the high court erred in its 1973 decision. “That will happen, and that’ll happen automatically, in my opinion, because I am putting pro-life [anti-abortion] justices on the court,” Trump said at a presidential debate against Democratic candidate Hillary Clinton. But in an interview broadcast on Sunday, Trump told Fox News that he "probably" will not ask his nominee how he or she would vote on Roe versus Wade, adding that he is putting "conservative people on" the court. FILE - Protesters on both sides of the abortion issue are seen gathered outside the U.S. Supreme Court in Washington, Jan. 19, 2018. Democrats won’t be able to block Trump’s nominee on their own, but could be joined by moderate Republicans who back abortion rights. “I would not support a nominee who demonstrated hostility to Roe v. Wade, because that would mean to me that their judicial philosophy does not include a respect for established decisions.” Republican Senator Susan Collins of Maine told CNN's State of the Union. Senate Republicans are promising a confirmation vote before the November midterm elections. Last year, three Senate Democrats joined Republicans to confirm Trump’s first Supreme Court nominee, Neil Gorsuch, a staunch judicial conservative. Trump could have even more high court vacancies to fill, as Kennedy is one of four justices over the age of 70.